We love the look of the stackable bands and bangles. These beautiful bands by Mémoire are available in many styles and metals. The rings can be mixed and matched for a different look every day. Never concerned about service after the sale. I know they will be here tomorrow, and for years to come. I have been shopping with Pav & Broome for 25 years. Of course, I went to Pav & Broome, to find the perfect gift for our tenth anniversary. I upgraded our rings and purchased the Past, Present & Future ring for my wife. We are always happy with our purchases and their service, they always provide great work! Immediately, it jumps out at you, Pav & Broome is the premier jeweler, not only for Gulfport but for all of South Mississippi. When I think of quality brands, Pav & Broome is going to come to mind every time. 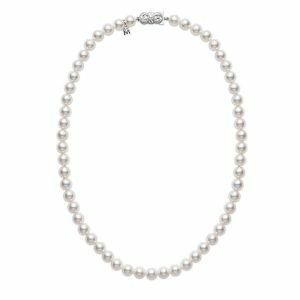 I purchased a strand of Pearls for my wife in celebration of our wedding anniversary, and she still enjoys wearing them 20 years later.... and more recently, I purchased a strand of pearls for my Granddaughter. Had my Tag worked on and they were so nice from the salespeople to the men in the back. I would gladly take my watch to them instead of of any other tag retailer. Thank you to Gail and staff for making this beautiful pendent out of Randy and I wedding bands for my Christmas gift. I visited Pav & Broome Diamond Jewelers to have a diamond I purchased in Afghanistan appraised. While my diamond was being appraised, Victoria encouraged me to look at settings for my stone. She helped me find a setting that was $700 less than the one I had priced somewhere else. Not only was it less expensive, it was bigger and heavier! The other jeweler was clearly trying to rip me off. Not only did Pav & Broome Diamond Jewelers save me $700, the service was amazing! I felt like more than just a customer, and I am a loyal one now! I wanted to take the time to thank you for your help in getting my appraisal AND choosing my engagement ring. Victoria was honest and let me know she was genuinely interested in helping me. I didn’t feel like a random person or just a number in a jewelry store. She didn’t try to scam me or talk over my head using fancy terminology. She made me feel like I mattered and that it was important to her that I got what I wanted and knew what I was getting. Although this is my second marriage, she understood how important it was to me; she did not judge or shun me. I am really excited and feel blessed; I saved money and got a better quality setting. Your store is beautiful, and I am thrilled to have my diamond set there. My engagement ring, wedding ring and all of my future jewelry will be made and/or bought from this establishment. I’m truly impressed and satisfied. God bless you and see you soon. Truly forever. Me and my wife was welcome from the time we walked into the store and the costumer service was great. The knowledge of the product and the buying experience was great also. Service after the sale was great also, I would highly recommend Pav and Broome to family, friends and anyone who is looking for a great product and a good price. Went in there to get my watch band replaced. I was casually talking to the employees about how I was in college and pretty broke, etc. Mr. Broome decided to do it for free. That act of kindness made my week. Thank you guys so much. Fixed my ring that was smashed in a door. I really expected it couldn’t be fixed but they fixed it and you can’t even tell it was ever damaged. When I go in to buy jewelry, whether it is a necklace or ring, whatever I need, everyone is always very helpful. Pav & Broome has been my jeweler for more than 20 years. I can always find something very different and my wife has always been very happy with the box I come home with.